Money Wise with The Money Guys | Applied Financial Planning, Inc. The KRLA and KKLA Money Guys have launched their own weekly radio talk show. Money Wise features The Money Guys team of experienced professionals from Applied Financial Planning who discuss a wide range of current topics and events and highlight how they impact the financial health of Orange County residents and businesses. Topics range from impending tax changes on the market and the effect on your portfolio to saving for college, the pinch on local government pensions, and more. 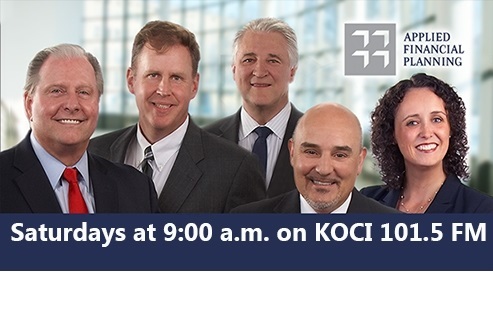 The program airs each Saturday morning at 9:00 a.m. on 101.5 FM, KOCI. If you are unable to get the signal on your radio, click the button below at 9:00 a.m. on Saturday to listen to a live stream of the station's programming. You can listen to a selection of our previous episodes in the archive below. Economic forecasts set forth may not develop as predicted. Investing involves risks including possible loss of principal. No investment strategy or risk management technique can guarantee return or eliminate risk in all market environments. Traditional IRA account owners should consider the tax ramifications, age and income restrictions in regards to executing a conversion from a Traditional IRA to a Roth IRA. the converted amount is generally subject to income taxation. Investing in Real Estate Investment Trusts (REITs) involves special risks such as potential illiquidity and may not be suitable for all investors.